The Lewiston Blue Devils swept the inaugural KVAC meet of the 2018 season with both the boys team and the girls team besting the six team fields. Because of the dramatic reconstruction going on at the Franklin Pasture facility adjacent to the Lewiston High School, the meet was held at the Bates College track on Russell Street. 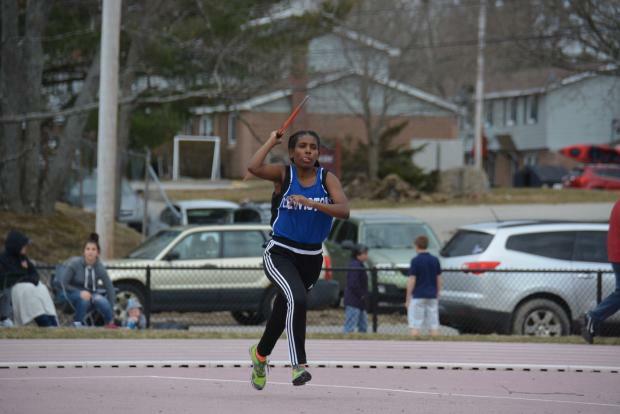 Lewiston expects to be hosting this meet at its new track at LHS by next season. On the girls side, Lewiston collected 128 points with Belfast not far behind with 117. Cony (116) took third followed by Maranacook (108), and Brunswick (60). Camden Hills rounded out the field with 38. The Blue Devils took the girls team title with just three outright wins as Zaid Teklu took the top spot in the 3200 while Laila Bunnitt took first in the shot put. Teklu was also a part of the winning 4 x 800 relay along with Brooke Cloutier, Hafido Awil, and Juliet Bolduc. The Lewiston boys had a little more breathing room with169.5 points while Cony was safely back in second at 127. Brunswick was third (85) followed by Maranacook (81), Belfast (80.5) and Camden (40). Individual winners for the Blue Devils were Isiah Leach in the 110 hurdles, Connor Kaplinger in the javelin throw, and Nicholas Roy who left the field far behind in the 1600 meter race walk. Lewiston was also credited with the top spot in the boys 4 x 400. Meets scheduled before April vacation are rare; three were scheduled but Mt. Blue's was postponed due to field conditions. Early meets can be difficult as family travel and transitions between sports can leave teams shorthanded and weather can impact performances. Even so, with six mid-sized to large squads present and the weather cooperating for most of the day a significant number of competitors have already staked their claims for spots in June State Championship meets, particularly in the shorter distances. Belfast took first place in eight of nineteen events in the girls meet. On the track the Lions were lead by Junne McIntire with top spots in with 100 and 200 meter runs, the sophomore was also pivotal for Belfast's winning 4 x 100, and 4 x 400 teams. Emily Jolliffe blazed to an 800 meter win at 2:27 while Kelsey Mehuren took the 300 meter hurdles. Both Jolliffe and Mehuren ran in Belfast's two winning relay teams. 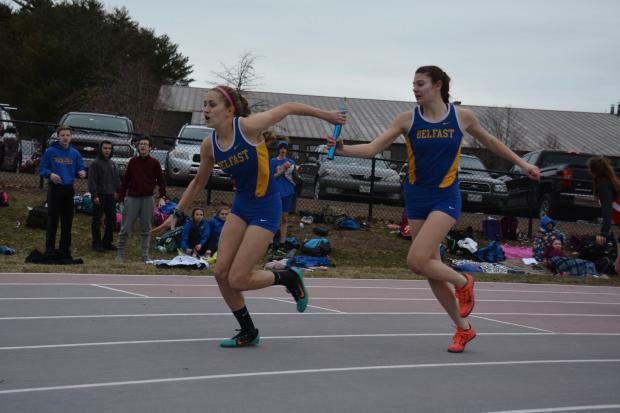 The fourth member of the 4 x 400 team, Lillie Mitchell, helped Belfast dominate the sandy jumps; the freshman claimed top spots in both the long and triple jumps. The Cony Rams were led by Anna Reny with wins in the 400 and the 100 hurdles. Reny also took the third spot in the 200 meter run at 27.53 which gave her three automatic qualifiers for the state meet. Gabby Low took the javelin throw while Annemarie Towle claimed the top spot in the 1600 race-walk. Low's throw of 102'3' will get her back to the state meet where the junior placed third last season. Look for the Rams to be a greater factor in the distance events later in the season when Cecilia Guadalupi rejoins the team; the sophomore, along with Gabby Low, is coming off an extremely competitive swim season that saw the Rams win a State Championship and the pair distinguish themselves at the YMCA Nationals earlier this month in North Carolina. Maranacook was led by senior Nicole D'Angelo with first place finishes in the shot put and pole vault; D'Angelo took second in both events at the Class C state meet last season. Ashley Cray cleared 4'8" to take the top spot in the high jump for the Black Bears. Brunswick's scoring was led by Isabella Pols with a first in the 1600; Pols also placed in the 3200 and 400. While Camden took no individual titles the Windjammers had a strong showing from Audrey Clement; the senior was second to Belfast's McIntire in both the 100 and 200, but her times (13.24 and 27.44) will see her through to the State Championship meet. Expect Grace Iltis to figure in the scoring at the distance events once she rejoins the team. The Lewiston Boys team won by scattering four wins across events, placing high in events they didn't win and often placing two or three competitors per event. By contrast the second place Cony Rams dominated the 400, 800, and 1600 with Travis Nickerson, James Olivier, and Caleb Richardson taking the wins. The three were joined by Jack Wroten to crush the field in the 4 X 800 nabbing a fourth win for the Rams. Wroten placed in the 1600 and 800 as well. The Brunswick Dragons took five individual wins to grab the third spot. Hunter Parker swept the short sprints running 11.66 in the 100 and 23.72 in the 200. Parker also anchored Brunswick's winning 4 x100 team. Caleb Rand took the pole vault at 12' while Sam Cenescar cleared 6'2' as the Dragons swept the vertical jumps. 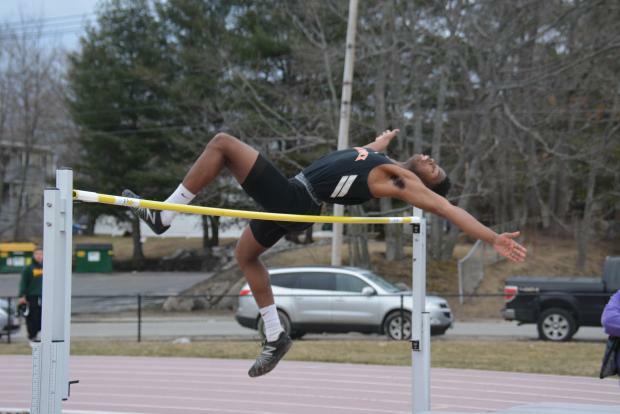 Cenescar cleared 6'2" with ease and claimed the win on jumps as Cony's Elijah Dutil also made the height. Lewiston's Jeremiah Williams and Brunswick's Ryan Olson were just behind at 6'0" with the Blue Devils getting the third spot on jumps. Olson was back and forth between the high jump and pole vault where he took the third spot. Dutil and Cenescar were together on the podium at the 2017 State Championships and Olson has cleared 6'0" before, but the Blue Devils Williams announced himself with a new PR at 6'0". The sophomore topped his prior best by four inches as he looks to break into the elite high jumpers in the KVAC. 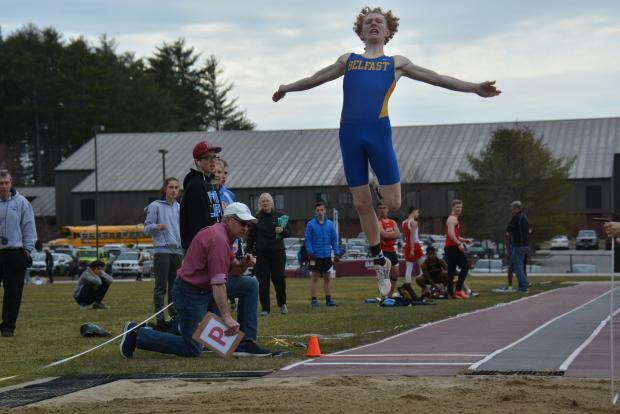 Individual winners for Belfast were James Robbins in the shot, Donald Resh in the discus, and Jack Hansen in both the Long Jump (20'1"), and 300M hurdles. Hansen is the reigning Class B State Champion in the long jump pit. Maranacook's Carter McPhedran won the 3200 meter run to lead the Black Bears to a fourth place team finish while Camden's Sam Hebert took first in the triple jump. Brunswick and Cony meet again on April 26th at Lisbon, Belfast will travel to the Camden Invitational on April 27th. 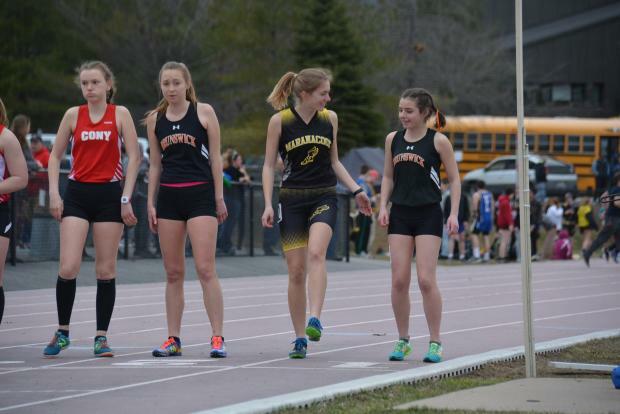 Maranacook also hosts a meet on April 27th.